even though i now feel as if i've now reached the peak where i no longer feel old enough to dress up in costumes, halloween is still one of my favourite events of the year. 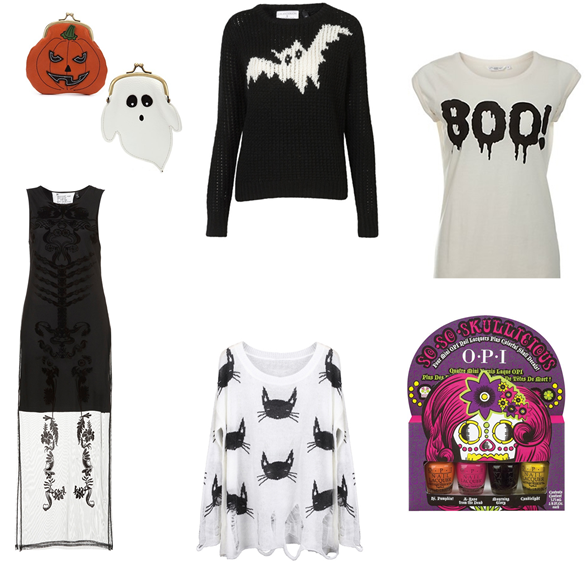 i still want to get into the spirit of halloween and the J.W anderson bat jumper would be a good start. LFW created a hype despite having a pretty heavy price tag at £70, but currently internacionalé are selling a pretty good dupe for £10. the halloween purses are a cute little addition if you aren't willing to go "all out" with the halloween dress code, or they could be a prize if you're hosting a halloween party for the winner at apple bobbing. whether you're going out dressed up, just slightly making your contribution with the add on cat ears or doing the more traditional things such as carving pumpkins i hope you all have a great halloween. Halloween is my favourite time of the year too!